A few weeks ago, MB and I flew down to Florida for a wedding on her side of the family. It turned into a raucously good time, winding up as a family reunion of sorts with about 25 people attending from all over the country. signature signs still up in celebration. There were even some billboards congratulating him. I turned the satellite radio to Radio Margaritaville and played it loud while MB knitted. 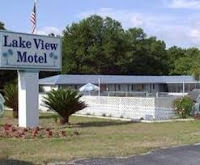 We had made reservations at one of the places to stay in Crescent City, the Lake View Motel. 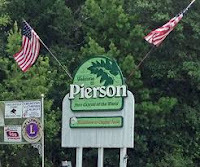 It had been a number of years since I stayed in a “motel” (a word coined mid-20th century for Motor Hotel, in other words along the road) and I had a pretty low bar set for what we would find. At $70 a night, you need to set your sights a little lower. This place was your basic cinder block construction, painted bright white with a very well kept outside appearance. To our surprise, the hotel while dating from the 1950s, was very well kept inside, clean and bright, and the proprietors (a Middle eastern family) very friendly. They’ve evidently run the place for almost 10 years and clearly take pride in it; the place was full for the weekend with all 18 rooms in use. Our room had an issue with a toilet that wouldn’t flush very well. We reported it the first morning and they attempted to fix it while we were out. Unable to do so properly, the owner went and purchased a new one and he and his handyman installed it the next morning while we went out for breakfast. The only thing missing in the motel was any kind of internet but we got around that by going to McDonalds to use their wifi one morning, allowing us to keep up with the rest of the world. There were lots of pictures taken, lots of food was consumed (nearly all of it was fried, much to the disgust of MB who is not a fan of bar food anyway) and plenty of drinks were drunk. A large time was shaping up to be had by all! About 6:30, the musical provider began setting up. I thought it was a DJ at first; he was setting up a portable PA system (Fender Passport – a real nice, small system) a computer with lots of music loaded up, and a microphone system. Hmm. Was this karaoke? He carried in a guitar gig bag containing a Fender Strat knockoff, and a keyboard and stand, and set those up, too. Apparently, he was a musician! By then, he had a helper who stationed himself at the computer. They talked back and forth for a few minutes and then started the show. The singer stepped up to the keyboard, pulled the mic up to his mouth and introduced himself. (I didn’t catch the name.) He said to be prepared to dance and have some fun! The music started and he began singing a KC and the Sunshine Band number. Tables were pulled back to clear a space for a dance floor and the bride and groom got their first dance in as the singer switched to something slow. All the other traditional dances (father and bride, mom and groom, etc) took place and there was great picture taking going on throughout all of it. After the bridal party finished all the planned bits, the singer began performing a string of dance numbers and up tempo songs to get folks out on the dance floor. Up to this point, I’d been off to the side taking pictures and singing along. 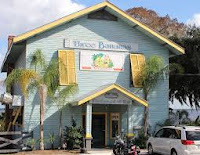 I caught MB’s eye and we headed out to dance. And then, it got kind of weird…. Somewhere along about the fourth or fifth song, I found myself directly in front of the singer. I forget what song he was doing but a guitar solo was about to come up on it (at least that’s what the original had) and I turned to watch him play it. I watched the singer’s left hand and realized he was playing in the wrong position on the fretboard, playing the wrong notes. When I looked at his right hand, he wasn’t playing the correct string, either. He was singing the song, and very well, too, but he was totally faking the guitar work! 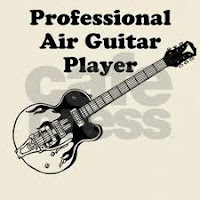 Just to be sure, I looked at the guitar cable and noticed that it wasn’t plugged into the amp or a mixing board either. In fact, it seemed to just disappear under a mat that he was standing on. I stared in absolute fascination. I have never seen anything like this before and just couldn’t imagine that I was the only one who noticed. A hundred things passed through my mind, like did he think he was fooling people? Was I the only guitar player to see him in action? Does he think he’s actually playing? The guy had a decent voice and was quite a showman with all the stage moves that one sees in house bands. Maybe it was just this song, and I was mistaken. At the end of the number, he put the guitar back in the stand, took a sip of water, and moved over to the keyboard. I watched him hit a couple of buttons as if he was selecting a particular instrument or tone. Then he counted in and his assistant hit play on the computer for the next song. Almost immediately, he began pounding on the keys and while he was in the correct rhythm he wasn’t playing anything remotely like the music coming out of the speakers. I followed the connector cable coming out of the back of the keyboard and it went under the same mat as the guitar and no other cables were coming out. Another fake instrument! I went back to dancing and smiling and laughing with all the other family members and guests. “I think he’s a really good karaoke performer.” Was my reply. “He’s singing but he’s not playing anything. Neither of his instruments are plugged into anything and he’s not even playing the correct notes. Watch him right now and tell me if you can see him playing the piano like the music sounds.” She listened intently for a minute while watching his hands on the keys. “Oh my god! You’re right!” She wandered off to tell her husband and soon, just about everyone in the wedding party knew and was talking about it. There were lots of knowing looks and giggles passed around during the next couple of hours. By the time MB and I headed back to the hotel, it was no longer an item for discussion. It was, however, a topic for conversation at our gathering the next couple of days. So, a guy who doesn’t actually play any instruments (although he fervently pretends to do so) has a following of adoring regulars, who come out to celebrate his faking it (perhaps they don’t know it) and they dance and sing while he spins the tunes and appears to be doing something they really like, leading a big party every weekend. 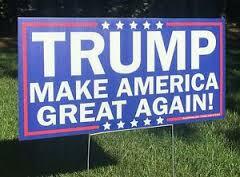 Now I understand all of the Trump signs scattered all over the area!